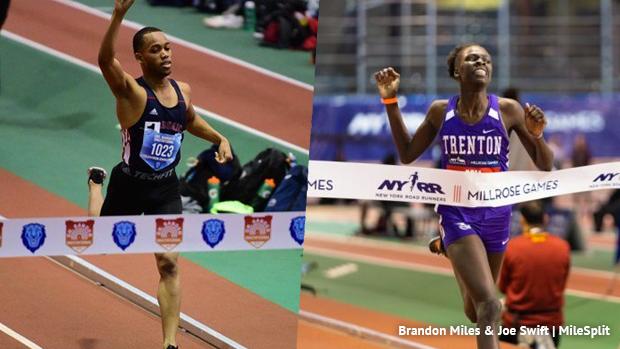 New Jersey has a strong history in the mid-distance category and it will once again be on showcase as we close the 2019 indoor track season at New Balance Nationals Indoor. Here are some quick notes about our mid-distance stars as we close the 2019 indoor campaign. Athing Mu of Trenton TC, the defending New Balance Nationals Indoor champion, currently leads the country in the girls 800m with her 2:03.98 from the Camel City Elite Invitational on February 1st. She also leads the US in the 400m, 52.55, 600m, 1:23.57, 1000m, 2:44.43, and is US#11 in the 200m at 24.11. That US#1 800m by Mu was a New Jersey state record, a National junior class record, and US#4 all-time. Just one of the junior's many accolades this season which most recently includes an American record and world leading performance in the 600m when she won the USATF Indoor Championships at 1:23.57. Expect a special performance in the 800m at NBNI, that National record of 2:01.78 is in severe danger to say the least. Athing Mu and Victoria Vanriele were the #1 and #3 returners in the country from 2018. The top three finishers from last year's NBNI are back for more, Nikki Merrill of Rhode Island in that mix. Victoria Vanriele is coming off her third straight Indoor NJSIAA Meet of Champions victory in the event. 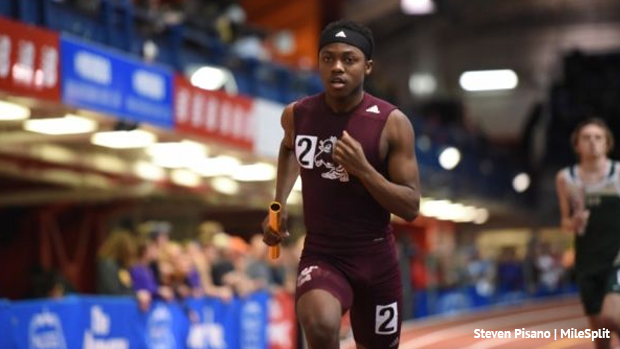 New Jersey had the top three returning boys in the NATION from last indoor season. Luis Peralta and Sean Dolan were All-Americans with their 1:51.74 and 1:51.77 out of the unseeded heat at Nationals and the third returner was Alfred Chawonza at 1:52.43. Speaking of Alfred Chawonza, the St. Benedict's senior currently leads the US with his fresh 1:50.57 on February 24th at the Boston University Last Chance meet. He and, defending outdoor winner, Luis Peralta, who ranks US#5 this year at 1:52.21, are sure to be in the running for the national title. Luis Peralta has the 800m Outdoor title, now eyes the New Balance Nationals Indoor Championship. He led all returners in the county both indoor and outdoor, won the 2018 outdoor title, and has his focus on running the fastest time possible this season. He even skipped the NJSIAA State Championship meets to focus on training and setting the fastest time he can and it is time to see it unfold on the biggest high school stage. Not Running - Defending New Balance Nationals Outdoor mile champion Sean Dolan of Hopewell Valley unfortunately had to make the hard decision to shut down his season due to a nagging injury and looks ahead to a healthy spring. With his indoor 800m PR of 1:51.77 and his 4:09.55 in the mile this season he would have been a factor wherever he ran. This season he moved up to fourth all-time in New Jersey indoor history for the mile when he ran that 4:09.55 for third in the boys race at the Millrose Games. Meet of Champions winner Elijah Brown of Union Catholic enters the 800m Championship with a US#14 1:53.98. This isn't just about individuals, NJ leads the US in the boys and girls 4x800m. Union Catholic girls and St. Benedict's Prep boys swept the Millrose Games 4x800s with times of 9:07.44 and 7:43.68. Ridge girls, the NJ Meet of Champions winners, are US#5 at 9:15.07 and we also have four boys squads in the top 15 nationally with the addition of St. Peter's Prep, Ridge, and East Brunswick. St. Benedict's Prep has three boys in the top 20 US 800m Rankings. Alfred Chawonza US#1 1:50.57, Jackson Burnett US#13 1:53.97, Lewis Ngwenya US#17 1:54.03. NJ has won the girls New Balance Nationals Indoor 4x800m Championship five of the past ten years. Southern Regional, 2009, Red Bank Catholic, 2011, Freehold Twp, 2014, and Ridge 2017 and 2018 with a shot for their third straight. A history of excellence, New Jersey has three boys in the top five US all-time. Robby Andrews #2 with a 1:49.21 (his national record from 2009 broken just last year by Josh Hoey at 1:47.67), Ben Malone #4 1:49.94, and Rey Rivera #5 1:50.04. The girls have two in the top five and three in the top ten with Athing Mu #4 2:03.98, Ajee' Wilson #5 2:04.13, and Joetta Clark-Diggs #9 2:06.00.